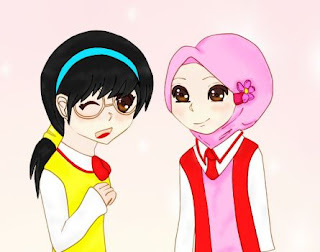 Wardah: I love you sisters..
We were talking about current issues, social problems, etc. Then she said,"Orang tak pakai tudung lagi banyak yang baik, lebih baik tak payah pakai tudung kalau perangai tak baik. A lot of muslims out there are wearing tudung but perangai diorang buruk. Not a good muslim. The one who are not wearing tudung are better." I replied,"It is true when you say ada orang pakai tudung tapi perangai buruk and sebaliknya but when you disobey what Allah told you to do, yes, you maybe a good 'person' but definitely you are not a good Muslim. Pakai tudung is compulsary for muslim. It s stated in the Quran and if u say u are a good Muslim, u must pakai tudung. When u pakai tudung and u behave badly, that is another story. I agree, a lot of muslim girl who are not wearing tudung are better person as a person, but in Islam, u are still not considered as a good muslim. I am not telling that I wear tudung and I am a good muslim but of course, you have to really try to be a good one." Actually, I didn't notice that day that she was suddenly quiet, no comment until yesterday she messaged me while I was away from office, following medical team to help flood victims. And, to be true, no heart feeling when she was complaining about that. I am asking you my Muslim fellow..
...You know what is it..